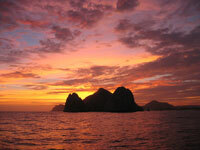 This tour is for couples looking for a romantic evening in Cabo San Lucas. Perhaps it's your honeymoon, anniversary, or you just want to spend a special evening with your sweetheart. There are no kids allowed on this tour, it's especially for lovers. The evening begins as you are picked up from your hotel (or marina) and are escorted to a beautiful custom 45-foot sailboat for a romantic sunset sail on the Sea of Cortez. You'll enjoy cheese and hors d'oeuvres while sipping champagne or drinks from the open bar as the sun sets over El Arco and Cabo San Lucas. You'll meet the owner of the boat, who will play host to you for the duration of your sailing adventure. Wednesdays from 4:00PM to 8:00PM. Free pickup and dropoff service, Champagne, Open Bar, Cheese, Fruit, Snacks. Adults only - this is a couples oriented tour. Did you know that the Dream Seaker is also available for Private Charters? Click Here to See!